Teach students about the design process – Students receive a workbook which guides them through the design process, from researching existing products to conceptualising and developing their own ideas. Teach students basic CAD skills – Students get to model their design in Tinkercad, a free and easy to use web based software. Encourage creativity – Students get to exercise creativity in thinking up their own ideas. Give ownership – Students have a sense of ownership in the design process, knowing what they are designing is something they get to take home and keep. Put theory in practice - Students get to put STEM theory learnt in the classroom into practice through hands on application. Be hands on – Students get to actually build and assemble what they have designed, teaching them practical hands on skills. Be rewarding – Projects are fun and useful products that once students have designed and built, get to take home and use. Teach about 3D printing – Students will learn about 3D printing and how the technology is used to turn concepts into reality. 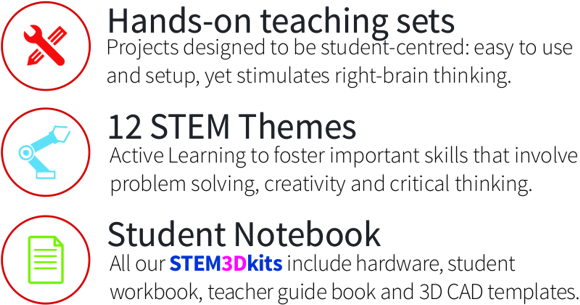 Be teaching aids – Teachers can use the completed projects as teaching aids to demonstrate STEM principles and also do further teaching lessons in the STEM areas.